Connected with Xian and Dunhuang, this Silk Road tour is best for people who come to China for the first time, and interested in the Silk Road’s culture and history. 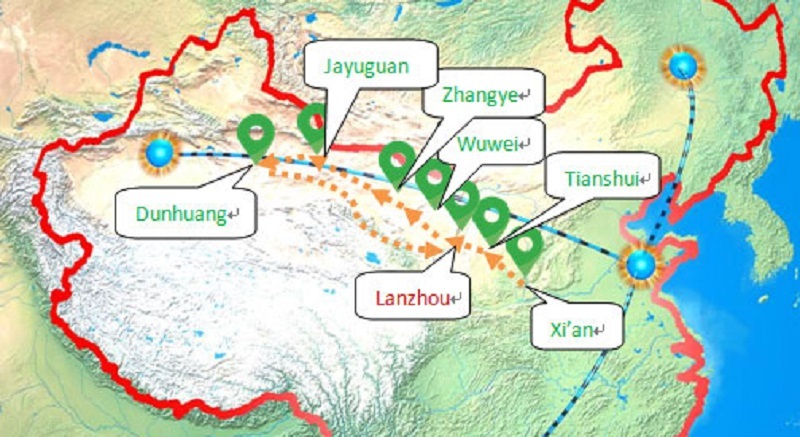 For reasons of simple geography, travellers leaving or entering China to or from Central Asia and the West have always been channeled through the narrow strip of land that runs 1000km northwest of Lanzhou. With the foothills of the Qilian Shan range, soaring up to the south, and a merciless combination of water-less desert and mountain to the north, start from the Wushaoling from the east to Dunhuang at the west stretches 900 kilometers and to the west of the Yellow River, the road known as the Hexi Corridor. Historically, whoever controlled the corridor could operate a stranglehold on the fabulous riches of the Silk Road trade. Inevitably the Chinese took an interest from the earliest times, and a certain amount of Great Wall-building was already taking place along the Hexi Corridor under Emperor Wudi in the Western Han Dynasty. Subsequently, the powerful Han dynasty succeeded in incorporating the region into their empire, though the influence of central government remained far from constant for many centuries afterwards, as Tibetans, Uigurs and then Mongols vied for control. Not until the Mongol conquests of the thirteenth century did the corridor finally become a settled part of the Chinese empire, with the Ming consolidating the old Great Wall positions and building its magnificent last fort at Jiayuguan. Labrang Monastery: One of the six Tibetan Buddhist Monastery in China, the largest Tibetan Buddhism education center in Gansu. Colourful Mountains: one of the most beautiful colourful Danxia Landform in China. Mogao Grottoes: One of four largest grottoes in China, the largest, richest and oldest Buddhist caves in the world. We take a flight to Xian today. Xi’an, the city that steeped in history and still giving up secrets, is your gateway to ancient Chinese civilization. In its 3,100 recorded years of evolution, it has been home to 13 dynasties. Xian was also the end of civilization for those setting out on the famous Silk Road. Today Xian is a vibrant, modern city, but surrounded by history, even underfoot! We arrive at Xi’an in the afternoon, and free and easy in the Hui People Street. Most people like to have some free time on the first day of arrival to adjust to their jet lag. If, however, you are an energetic person and prefer to explore the city upon your arrival, we can fill your schedule for you. Today, enjoy your full day visit to the Terracotta Warriors, it is one of the world most important archaeological finds, with troops, horses and carriages in battle formation and then to see the Big Wild Goose Pagoda, and the massive Xian City Wall. If you are interested, you can enjoy the Tang Dynasty Show with Dinner as your optional night activity. As an ancient capital city to 13 dynasties, Xian has a rich recorded history, frequently enhanced by the evidence of new discoveries, like the 1974 unearthing of the fabulous Terracotta Warriors, the long forgotten army created to guard Emperor Qin Shihuang tomb. In accordance with ancient beliefs, this grand project was mounted at enormous cost by the cruel and tyrannical Emperor, only to be attacked, plundered, burnt and buried after his funeral by the peasants who had labored under the whip to build it. Then, over two thousand years later, this “Eighth Wonder of the World” was rediscovered by farmers digging a well. The fine troops, horses and carriages in battle formation are a National ancient art treasure. Three excavation pits are now opened to the public and a fourth is nearing completion. You can, like US President Clinton, now gaze in wonder upon this historic site, listed by UNESCO in 1987 as a world cultural heritage. The Xian City Wall, which stretches round the old city. Xian was always a walled city, and today wall represents one of the oldest and best preserved Chinese city walls, as well being one of the largest ancient military defensive systems in the world. The first city wall of Chang’an was begun in 194 BCE. The existing wall was started during the Ming Dynasty in 1370; it is massive, measuring 13.7 km in circumference, 12 m in height, and 15–18 m in thickness at the base. The South Gate and North Gate are the two main entrances to the inner city. The city itself is neatly arranged along the city wall. This impressive structure is just a precursor to the remarkable discoveries awaiting visitors to Xian. The Big Wild Goose Pagoda was built in 652 during the Tang Dynasty and originally had five stories, although the structure was rebuilt in 704 during the reign of Empress Wu Zetian and its exterior brick facade renovated during the Ming Dynasty. One of the pagoda’s many functions was to hold sutras and figurines of the Buddha that were brought to China from India by the Buddhist translator and travelers Xuanzang. Now this well-preserved holy place for Buddhist has been the symbol of Xian. Choose a Tang Dynasty Show with Dinner would be a good idea. You will enjoy the sumptuous dinner while watching a fabulous dancing and singing performance of the Tang Dynasty. This is not only a performance of Chinese traditional dancing and singing, but a re-enactment of Chinese ancient ceremony and culture. If you want to experience the lifestyle of Xi’an locals, just add a detour to explore a wet market or learn to cook a local dish from the locals — just tell us your interests. We are visiting the famous Shaanxi History Museum. Then we drive to next stop—Tianshui in Gansu Province, checking the hotel and take a short walk in the street. As the regional capital and doorway to the Silk Road, Xian was one of the richest, most well-protected cities in all of China. The famous Shaanxi History Museum introduces the visitor to area’s rich culture, from Emperor Qin Shihuang to the present day in this walled city. The museum is house in a striking Tang Dynasty-style pavilion and features an enormous collection of 113,000 historic and cultural relics. This is where you experience history, with chronological dynasties exhibits that take you through the dynasties. In the morning we driving to visit the Maijishan Grottoes, it is 50 km away from the downtown, one of four famous Buddhist Caves in China. We back to the city for lunch, and visit the Fuxi Temple in the afternoon, Fuxi is one of China’s three mythical ancestors. Fuxi Temple was originally constructed in the Ming Dynasty. The statue of Fuxi inside is the only one existing in China. Among other things he is credited with the creation of the Eight Diagrams on the ceiling, which represents mathematical permutations and ultimate order. Maijishan grottoes existing Buddhist caves and niches 194, clay stone carving approximately 7200, and wall murals over 1300 square meters. All caves and niches were dug in the cliff, distributed in the eastern and western. In Tang dynasty (AD734), a strong earthquake occurred in the vicinity of Tianshui, since that, Maiji Mountain cliff face central was collapsing, and the caves were divided into east cliff and west cliff two parts. There are 54 caves in the east cliff, and the rest are in the west cliff. West Cliff caves were finished earlier than East Cliff. in the cliffs. Only the volley plank road can make it possible to access one cave to another. The work of plank road and caves are daunting, especially in ancient times. The winding volley plank road is soul-stirring. But the scenery is so spectacular once you are up on the cliff and looking out at the countryside and down vertically below. Fuxi is a central character in Chinese cultural history. He is said to have invented writing, the catching of fish by nets, the trapping of animals, and the Ba Gua, the eight fundamental principles of reality. He comes from Tianshui, so this is one of the few, and the most important, shrines of Fuxi. In the morning we are driving to Lanzhou, the capital city of Gansu Province, Lanzhou is situated on the upper course of the Yellow River, where the river emerges from the mountains. It has been a center since early times, being at the southern end of the route leading via the Hexi Corridor across Central Asia. We arrive at Lanzhou at lunch time, and take a tour in Lanzhou to visit the Zhongshan Bridge, Water Wheel Park and the Mother Statue of Yellow River. The Water Wheel Park, the waterwheel is an architecture based on the Ming-Dynasty style. The diameter of it is 16.5 m, the end section with scraper sites, scraper installed equidistant between the rectangular Xiegua Pelton. Stand south of Yellow River water tankers, Wong water using the natural flow booster quarter turn; dry season Zeyi cofferdam water diversion together, through the weir small drainage, water gravity boost. When the water leaves the natural impulse wheel board, to promote the waterwheel turns, Pelton will scoop over the river, so go to the headspace and then dumped into the Mu Cao, steady stream, into the garden to facilitate irrigation. Waterwheel Park reproduce this ancient irrigation machinery, foreign visitors can glimpse faster. Zhongshan Bridge, also called the first bridge over the Yellow River, lies at the foot of Bai Ta Mountain and in front of Jin Cheng Pass in Lanzhou city, the capital of Gansu Province. The bridge was first built in 1907; the bridge was built by German and completed in two years, and named ‘Lanzhou Iron Bridge over the Yellow River’. In 1942, to commemorate Dr. Sun Yat-sen, the bridge was re-named Zhongshan Bridge (Zhongshan is the Chinese name of Dr. Sun Yat-sen). In the morning we driving to Wuwei, our bus will over the Wushao Range—the mountain between Loess Plateau to the east and Hexi Corridor to the west, the highest point we climb over is 3200 meters above the sea level. Visit the Leitai Tomb, Wuwei Wenmiao, checking in the hotel after the dinner. The Leitai Tomb of the Eastern Han Dynasty is a large brick-chambered tomb of late Eastern Han Dynasty discovered by local farmers in 1969 beneath an old locust tree. The tomb is famous for its bronze galloping horse unearthed. Leitai is a rectangular rammed terrace 8.5 meters high, 106 meters long from north to south and 60 meters wide from east to west. It was an ancient place for sacrificing the Thunder God, which was named after the Temple of Thunder God built in middle Ming Dynasty on a terrace as high as about ten meters. According to the inscriptions on the chest of the horse tomb figure unearthed, it was the tomb of General Zhang built between 186 to 219 A .D. Unearthed from it there were 231 pieces of artifacts including gold, silver, bronze, iron, jade, bone, stone and pottery articles as well as 99 ceremonious bronze chariot and horse figures, among which the one of the greatest artistic level is the bronze galloping horse. The Confucius Temple is known also as the Wenmiao Temple in Chinese, and is situated in the southeast of Wuwei City. This ancient complex dates from the Ming Dynasty having been established in 1439 on instructions from the reigning emperor and with the strong backing of public subscription. The Confucius Temple occupies a central position in the Confucian Temple complex and it is here that offerings are made in honor of Confucius. Other notable structures to be found here are the Dacheng Hall, Hastate Gate (Jimen), Lattice Gate(Lingxingmen), the Bridge of the “Number One Scholar” (Zhuangyuan Bridge) and the Banchi Pool. These latter features are in the south side of the complex. To the north there is the Sutra pavilion and in the west is the Liangzhou Mansion that houses the Confucian Academy.